With two veterinary hospitals, one for large animals and one for small animals, there are numerous specialty services and programs available that are an important part of our student educational experience as well as for the animal patients who walk through our doors. Come explore the many ways you can help our animal friends. 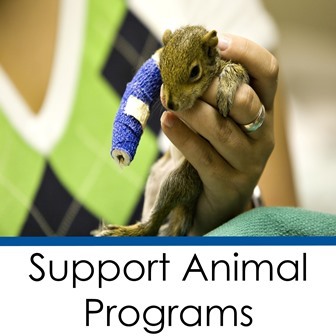 Support treatment of injured wildlife presented to the CVM-VMC with no other financial means of treatment; this would be for indigenous wildlife, not pets. Help homeless pets get healthy, stay healthy, and find loving families. To Develop and share novel strategies to help animal shelters end the euthanasia of healthy cats. Helps veterinary students improve their diagnostic, medical, and surgical skills by providing life-saving care to sick or injured animals from shelters or rescue organizations in the Gainesville-area. Once treated, the animals are adopted into permanent, loving homes.